If you are thinking of holidaying on the Costa Blanca this year why not plan your visit to include horse riding along the nature trails, sandy beaches, salt lakes, pine forests, lemon and orange groves. 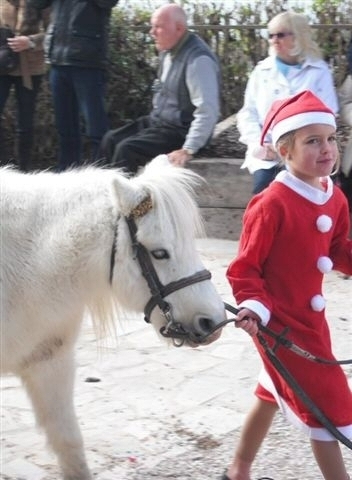 All this can be done on the Costa Blanca where you hire magnificent Andalucian or Hispano-Arab horses from local stables. There is not much in the world that can beat the excitement of galloping along the empty beaches and surf with the sea air blowing in your face. It is an exciting and exhilarating experience that should not be missed by anyone with a taste for the adventurous and a lust for the outdoor life and that feeling of freedom. The Costa Blanca is blessed with an abundance of natural beauty and what better way to see this than on the back of a powerful Spanish horse. 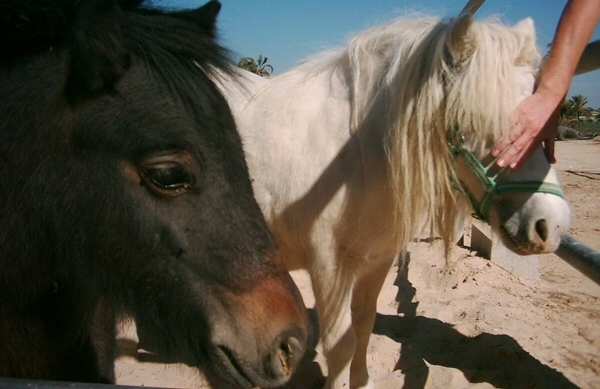 The Costa Blanca has a range of stables inland and on the coast that provide riding lessons for beginners and for more experienced riders wether you are you or old. Stables are open all year round and they have a range of facilities available where you can stay overnight on the longer treks or you can simple pay per hour. With prices from only 20-Euros per hour it's a great way to get closer to nature and to meet new friends. The Costa Blanca is full of Hotels that can be just booked for a night or two to fit your circumstances. If you are looking for the Hotel down in La Marina Village it can be found HERE or a direct link to bookin.com is also quite useful. Or perhaps you are intending to book a country villa or maybe a villa on an urbanisation the previos links should help you. Many of the stables have an indoor school where you can learn the art of horse riding before you hit the trails. The cost of the indoor school tuition is around 15-Euros per hour. This is a great way to understand the behavior of the horse and to learn the simple commands that you will need when you hit the trails. When the instructors consider you are competent enough then you can take to the trails in small groups. 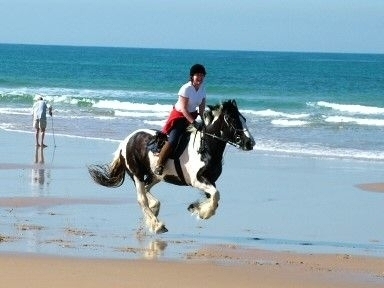 A little more practice and you will be galloping across the Costa Blanca sands in no time at all. If you are thinking of holidaying on the Costa Blanca this year why not plan your visit to coincide with one or more of the many events. 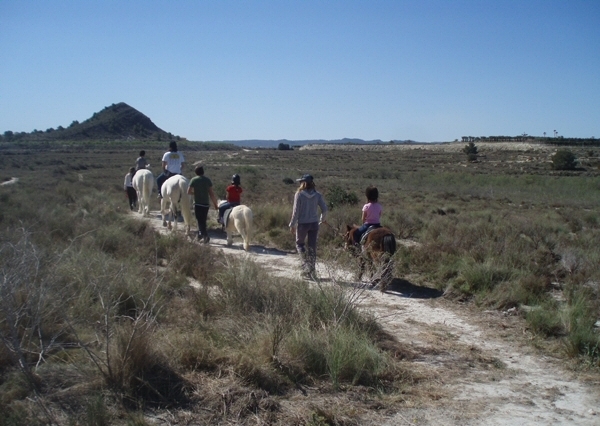 We have plenty of activities for you to enjoy during your stay on the Costa Blanca such as quadbiking, horseriding, pony trekking, fishing, waterski-ing, kneeboarding, kayaking, mountainbiking, walking and more! Any one of which will create wonderful memories of your time on the Costa Blanca for you and your family. Most activities take place on or around the Pedrera Lake, Torremendo. The area is truly breathtaking and unspoilt, rich in indigenous flora and fauna, surrounded by olive, orange and almond groves. A taste of the real Spain and yet only minutes from the AP7 motorway and just off the CV95 linking Torrevieja to Orihuela. Whether it is just one or two of you, a family or a large group, we can tailor make a package for you. We can now arrange multi-activity weekends with full accommodation, or team building and activity days. Children's parties, both quad and pony, with many combinations and extras such as face painting, treasure hunts are just some of our specialties. Whether you live in Spain, are a visitor or simply on holiday, with Things to do in Spain you can discover what this region really has to offer once you get away from all the usual tourist hotspots. 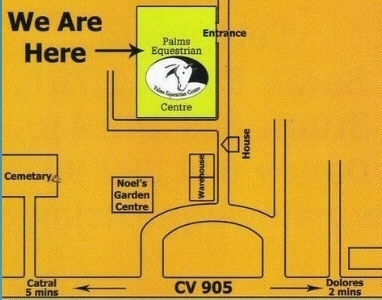 Situated in Catral on the Costa Blanca, Palms is a British family run riding centre. The centre is about a 10 minute drive only from La Marina Urbanisation. Owned by Sarah, Danny and their 11 year old daughter Billie. 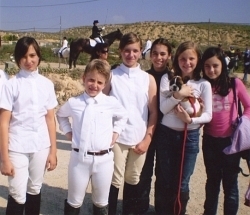 Fun family atmosphere, we offer riding lessons for children (5 yrs +) and adults of all levels and riding abilities. We have a great team of instructors who will make learning a relaxed and fun experience for all! We suggest where possible that you have a private/assessment lesson, so our instructor can safely and correctly advise you in which group to join. All groups are taught in a fun and relaxed way, making your learning an enjoyable yet informative experience. For those who are new to riding it's important to have one on one tuition, while you learn the basics and gain confidence. Once ready your instructor will advise you on a suitable group for you to join. Just need to brush up on your skills? This is a great way to get you back in the saddle and feeling confident again! This is a nice equestrian centre based in Valverde with a bar - about 15 min max drive from La Marina - Spanish run - its signposted from the Blue Star roundabout. 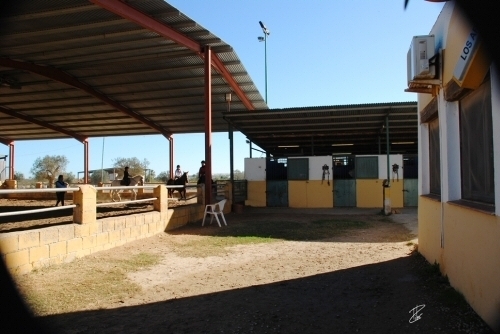 Based on the road to San Miguel de Salinas just past Villamartin Golf course this stable has a friendly atmosphere. 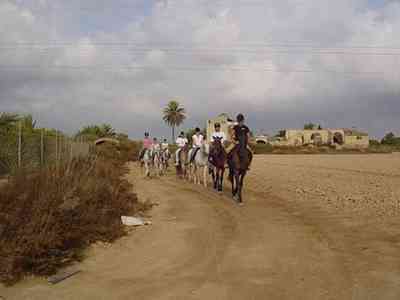 Lessons are provided or up to 4 people can ride out in a group into the surrounding countryside. Call 0034 965971537 for bookings. "Experiences and activities for the whole family"
This equestrian centre has everything you need for a great day out. As well as the horse riding there is a restaurant specialising in menu del dia, a large swimming pool - with free sun beds - and poolside bar. Instructors are available for beginners upwards and for experienced riders there is a 3-hour tour with a picnic for 45 euros‚ and there are 1 or 2 hour tours - with or without canter - for 15 euros‚ and 30 eurs‚. El Rancho is on the road to La Marquesa from Los Montesinos. Just take the La Marquesa road (it is signposted) from the centre of Los Montesinos and El Rancho is on your right after about 3 km. Call 0034 609541695. 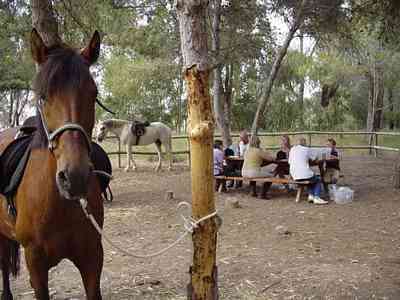 EL RANCHO is set in 25000 m2 of woodland just off the Montesinos/La Marquesa turning. This magnificent RANCH style property has plenty to offer for the young and the young at heart – where you can enjoy hours of activities either swimming in the Olympic style swimming pool , horse riding for both the experienced rider or as a beginner – or be that little bit more competitive with game of Petanca. Dinning is a must in the Rustic style Restaurant choosing from the lunch time menu which is changed daily or from the extensive “ a la cart “ menu on an evening. A variety of live entertainment is offered on selected nights throughout the week. Over night accommodation is available in our log cabins at very competitive prices. 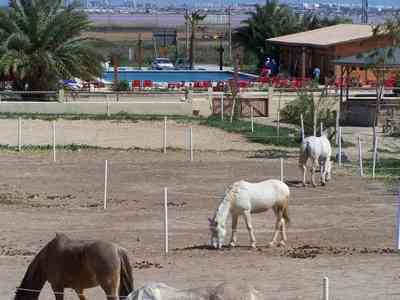 Welcome you to El Rancho come and enjoy the horse riding in a beautiful atmosphere. You can improve your riding skill or start as beginner together with our instructors. Our horses are Spanish and English with nice and calm characters. You are offered varies possibilities to ride. We have introduced three pre-pay packages to offer our regular clients the opportunity to ride at a reduced cost. 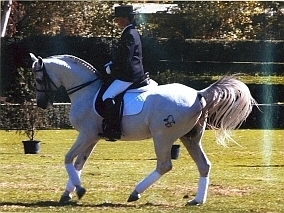 Following your assessment lesson, group lessons for beginners, novice and experienced riders will be arranged at the same time and day each week. This means classes will include students of the same riding ability to progress together. This complete program of lessons covers fun study topics on tack, feed, handling, grooming, pony care and of course riding. Package lessons will be held on Tuesday and Thursday evenings between 6 and 9pm. Save you €50 on our standard hourly rate. The Costa Blanca is full of Hotels that can be just booked for a night or two to fit your circumstances. If you are looking for the Hotel down in La Marina Village it can be found HERE or a direct link to bookin.com is also quite useful. Or perhaps you are intending to book a country villa or maybe a villa on an urbanisation the previos links should help you.